Are you looking for the Best Laptop for Medical School? Well, fret not! As you’ve landed in the right place and we’ve listed Top 5 Best Laptops for Medical Students; keeping various factors in mind. I’ve listed all the factors below that I’ve considered important while choosing these laptops. Hence make sure to go over all of them to get an idea about a few crucial factors that you might miss while choosing a laptop. Almost all the laptops listed here will last your entire medical school tenure because they contain the latest hardware, are incredibly lightweight and will be a complete bang for your buck. Thus, even if your budget for a laptop is just $500, do not worry as we’ve got you covered too. Therefore without wasting much time, shall we get started with the top laptop for medical school? Weight is a critical factor when considering a laptop for medical school and medical professionals as well. Given that you’ll be carrying your laptop in your backpack to-and-from school and around campus too, coupled with few books and other stuff, having the lightest laptop is an essential factor. Hence why I’ve listed only the best laptops that are lightweight at the same time. This is why none of the laptops featured in this list weigh more than 5 lbs (2.2kgs). As a result; be rest assured that the laptop you pick from this list will be light on your back and shoulders too. A processor as we all know is the most important component in a laptop. A processor decides how speedy your laptop is going to be. You can upgrade almost all the other components in your laptop but not a processor, hence choosing a decent laptop for medical college with the best processor money can buy is of utmost importance. Since you’ll require a laptop that will last your entire tenure of medical school, buying a laptop with at least Intel i5 processor is recommended. However, I do want to mention that laptop processors aren’t created equal to desktop processors. Take for example; an entry-level Intel Core i3-8100 desktop processor is 28% faster compared to Intel Core i5-8250U laptop processor. Whereas compared to a higher version, still the i3-8100 is 9% faster than mid-range Intel Core i5-8300H laptop processor.Hence why buying a laptop with at least Intel i5 processor is of extreme importance. Usually, a minimum of 8GB RAM is recommended, anything less than that will result in slower processing. Most laptops that come with 8GB RAM, have an additional RAM slot, hence later on after a couple of years, you can add another 8GB RAM stick to improve performance. SSDs are of utmost importance if you want to enjoy quick speeds while using your laptop. To give you an overview, your average 1TB 5400RPM HDD offers read/write speed of 8MB/s, whereas SSDs offer similar operation with a speed of over 500MB/s. SSDs also improve your laptop’s booting time, opening and saving files, downloading documents, streaming videos and helping speed up the processing power required in various medical softwares. Hence SSDs are the way to go by! There’s also a new technology called as Intel Optane Memory, which is featured in the #5th laptop. The goal of this technology is to make HDDs as fast as SSDs, and hence if any laptop has Intel Optane Memory, you don’t need to swap out the HDD for an SSD. Most of your time medical school will be spent viewing/downloading notes, documents, PDFs, presentation, slides, etc. Hence you’ll need a laptop that will be able to handle it properly. This is where laptops on #3 and #4 positions come into play because they feature a 3:2 Aspect ratio, which is excellent for all the stuff I mentioned above compared to the industry standard 16:9 aspect ratio. Moreover, the laptop will mostly be for personal use; therefore a screen size between13-15” will be ideal. This will make sure that the laptop is portable, easy to carry around and not tough to maintain too. Personally, I’m a big fan of /LG Gram/ line of laptops and have featured them in my earlier two guides about Ableton and Streaming Netflix. However, it costs over $1000, whereas, on the other hand, the Asus Zenbook 13 offers similar features and is priced almost $400 less than the LG Gram 13”. Even though the Zenbook UX330UA is heavier than LG Gram, it’s still lightweight and weighs around 2.6 pounds (1.17kgs) and can be easily carried around in your backpack. Moreover, for the price, the Asus Zenbook UX330UA is a premium laptop with design similar to Apple MacBook Air, while at the same time has unique quirks like fingerprint sensor, micro HDMI port and Asus’ spun-metal finish with concentric circles. These slews of features give the Zenbook unique characteristics, while at the same time making it the best laptop for medical students. Build entirely out of aluminum; the laptop provides a sturdy and solid build quality that will easily last through your entire tenure of medical school with fair usage. Asus Zenbook UX330UA will easily support and run smoothly everyday applications like word processing, internet browsing, downloading medical papers, running medical softwares and a bit of entertainment too with the inclusion of Intel Core i5-8250U processor and Intel UHD 620 Graphics. However the only downer on specifications front might be the 8GB LPDDR3 RAM; still, it won’t be a concern because the 256GB SSD will speed up your everyday processing like booting up, copying files, deleting trash and slew of other stuff. Since you’ll be dealing with a lot of assignments, presentations, and PDFs, you’ll need a crisp display, and the Zenbook offers it via the 13.3” Full HD display. Though it’s not as crisp as one can expect at this price point nor it’s an IPS display, despite that, you won’t feel much difference once you’d get used to it. Regardless of its few downfalls, the Asus Zenbook UX330UA is a capable laptop that will get you through your medical school without any issues. The first thing I would suggest; if you decide to buy this laptop, is to install an SSD drive in the provided M.2 slot for an additional $100 and transfer your OS from HDD to SSD using this guide. You may ask why I need spend extra $100 on another drive and go through all this trouble? As I mentioned above, the Read/Write speed of the provided internal Hard Disk is 8MB/s, whereas an SSD offers Read/Write speed of 500MB/s. This means your everyday tasks like Booting Speed, Transferring files, downloading files, opening of documents, loading of web pages, and even scientific analysis will be sped up just by upgrading to SSD, very essential if you’re a medical professional. 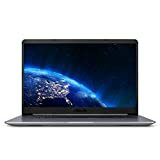 Once the OS is transferred from HDD to SSD, the Asus Vivobook F510UA is a competent laptop that is priced close to $500 and will be an ideal budget laptop for premed students or Biology Majors too. Though it’s not as lightweight as the previously mentioned Asus Zenbook UX330UA, yet it still weighs a lot less at 3.7 pounds (1.67 kgs) making it easy to carry around your medical school campus. Even at $200 lesser price than the Zenbook UX330UA, the Vivobook F510UA features a bigger 15.6” anti glare screen, 8GB DDR4 RAM and the same Intel Core i5-8250 processor coupled with Intel UHD 620 internal graphics. The screen on it is not only Full HD but also happens to have very thin bezels at 0.3” giving it almost 80% screen-to-body ratio. On the connectivity front, the Asus Vivobook F510UA includes USB 3.1 (Type C), USB 3.0, 2x USB 2.0, HDMI port and an SD Card slot as well. Additionally, it has an extra RAM slot, which can be used to upgrade this laptop with an extra 8GB RAM stick. Since most of the laptops come with 16:9 aspect ratio screen, it isn’t a good fit for above applications because you get less vertical real estate on your screen. However, on the other hand, the Microsoft Surface Laptop has adopted a rather 3:2 aspect ratio, which would be a good fit for a laptop for medical school. Microsoft has launched multiple iterations under the Surface brand. 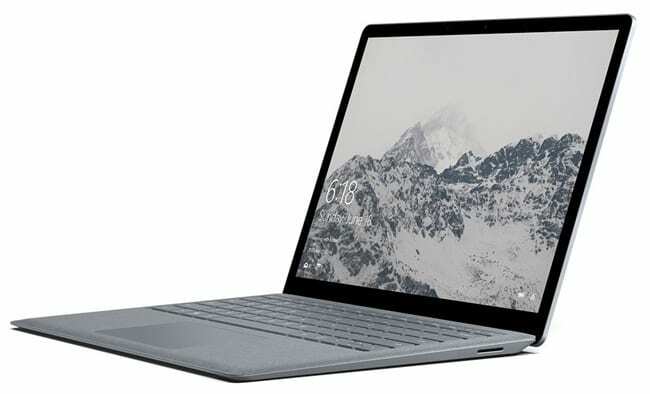 We have the Surface Pro tablet, Surface Book (laptop with removable screen) and the Surface Laptop, the one we are talking about, and it comes in 6 versions and 4 different colors. 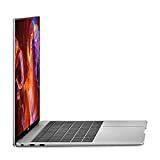 The one I’ve recommended in this post is the one with Intel Core i5 processor, 8GB RAM, and 256GB SSD Drive, which is ideal for all work and assignments given in your medical school and for some entertainment as well. The most significant advantage of Microsoft Surface Laptop is its battery life. It offers battery life between 10-12 hours on moderate usage; this makes sure you don’t keep running after the charger all the time. Additionally, it weighs only 2.76 pounds (1.25kgs) that makes it easy to carry around in a backpack with few additional books. The biggest advantage of using a lightweight laptop is that you can keep it on your lap for long hours without feeling its weight (like I’m doing writing this article on my Macbook Air) nor you feel its weight while carrying it around. One important thing to notice is that this laptop comes with a Windows 10 ‘S-Edition’ OS, which is Windows 10’s tablet based OS. However, out of the box, you can upgrade to Windows 10 Pro for free via the Microsoft Store; hence that won’t be an issue. Read this guide to know how to upgrade from Windows 10 S to Windows 10 Pro for free via Windows Store. There are high chances that you might not have heard of Huawei and don’t blame yourself if you haven’t. Yet Huawei is a world-renowned tech brand that manufactures smartphones in the premium and budget segment, and the Matebook X Pro is Huawei’s attempt at building a laptop. This isn’t the first time Huawei has tried its hand on manufacturing laptops, however this time they’ve got it right. The Huawei MateBook Pro X is an upgraded and beefed up version of the previously mentioned Microsoft Surface Laptop that offers almost all the features that Surface Laptop offers and a little more. Just like the Surface Laptop, the MateBook X Pro offers a 3:2 aspect ratio screen with a resolution of 3000×2000 px. The display used is an LTPS LCD, which nonetheless looks stunning and is a joy to watch Youtube Videos and do mild gaming. Even the bordering bezels are very thin on all four sides and offer a screen-to-body ratio of 91% (as claimed by Huawei) that makes it an exciting display panel. Coming to the keyboard, it’s backlit and typing on it is very easy, just like on Surface Laptop. Key travel is less; hence you get almost smooth feedback from each key just like you’ll do on Macbook Laptops. The one thing that has gotten much press for Huawei MateBook X Pro is the hidden webcam and its placement. The webcam is placed as a button on keyboard along with other function keys and pops up when you click it. On paper this idea looks exciting, however in reality, it’s just another mess because your face isn’t shown like we’re used to in other laptop’s webcam nor is the video quality something much to talk about. The Huawei MateBook X Pro is an exciting prospect from the Chinese brand offering a slim and easy to carry laptop that will be an excellent fit for medical school students. Not all of you are going to spend your years in a medical school with a laptop that doesn’t do gaming. All the above mentioned laptops are a great proposition for medical students and medical professionals; however they’re not meant for serious gaming. This is where MSI GV62 8RD steps in, which is a sub-$800 gaming laptop ideal for medical students. It comes with the latest Intel Core i5-8300H processor, coupled with 8GB DDR4 RAM, and a powerful and capable 4GB Nvidia GTX 1050Ti graphics card. 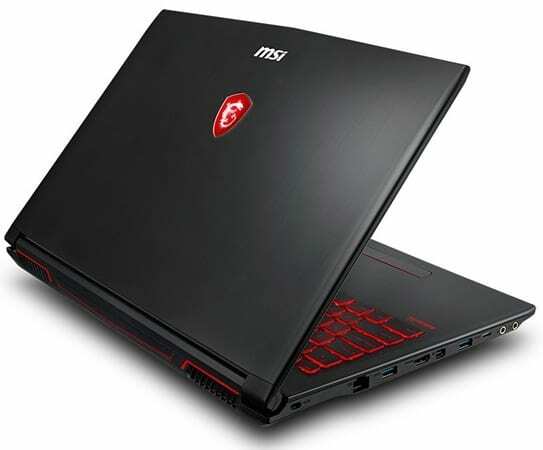 What’s exciting about MSI GV62 8RD is that it comes with a regular 1TB Hard Disk, however, MSI has included a 16GB Intel Optane Memory, which is a system accelerator and offers SSD like speed on your HDD. MSI is known for high priced laptops; however this one is in the budget segment and offers everything a budget gamer or medical student needs within a body that weighs only 4.8 lbs, making it a gaming laptop that you can easily carry around in your backpack. Additionally, it comes with a red-backlit keyboard that might be a bit too on the brighter side while using at night. It comes with a 15.6” Full HD IPS display that offers excellent color output. On the connectivity front, it includes a USB 3.0 port, 2x USB 2.0 port, SD Card, Bluetooth, Wifi and so on. 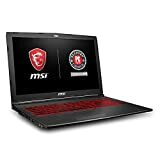 Hence as a medical school student, if you need a powerful laptop on which you can do serious gaming, MSI GB62 8RD should be your ideal choice. Most of the times; I suggest laptops that feature Intel processors; however that doesn’t mean AMD CPUs for laptop aren’t that good, it’s just that finding a properly configured AMD laptop is rare. After the massive success of Ryzen desktop CPUs, AMD has been on a roll and they went ahead and launched couple of powerful laptop CPUs too viz. AMD Ryzen 5 2500U and AMD Ryzen 7 2700U. The one that’s featured in the Acer Swift 3 is the AMD Ryzen 7 2700U, which is top-of-the-line laptop CPU from AMD currently. With performance extremely similar to Intel Core i5-8250U, while slightly better at times, laptops that contain Ryzen 7 2700U CPUs are slightly cheaper compared to laptops that come with the Intel counterpart. Acer Swift 3 is no exception. Acer has always been known for bringing out cost effective laptops but that kind of sometimes affects the quality too. Whereas the Swift is a sophisticated and premium laptop series from the Taiwanese brand. 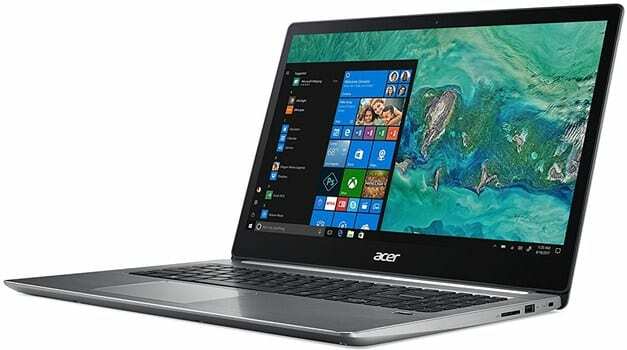 Priced close to $700; the Acer Swift 3 comes with a 15.6” Full HD IPS display that is encased within an all-metal body that offers an extremely premium look for the money you pay. It comes with a chiclet keyboard; having very low key-travel and happens to be backlit. Towards the lower right side of the keyboard, you can notice the fingerprint scanner that can be used to login to your laptop with the Windows Hello feature in the preinstalled Windows 10 OS. On the inside the laptop comes with AMD Ryzen 7 2700U CPU coupled with 8GB DDR4 RAM , 256GB SSD and an integrated AMD Radeon RX 540 GPU which is almost 70-80% faster compared to Intel’s UHD 620 integrated graphics. On full charge the laptop offers around 9 hours of battery life and weighs at 4.63 lbs. If you want a laptop that is light on your shoulder and offers a premium feel; just go with Acer Swift 3. Being a medical laptop; most of your time will be spent taking notes and drawing diagrams, and what better laptop than a touch screen laptop. 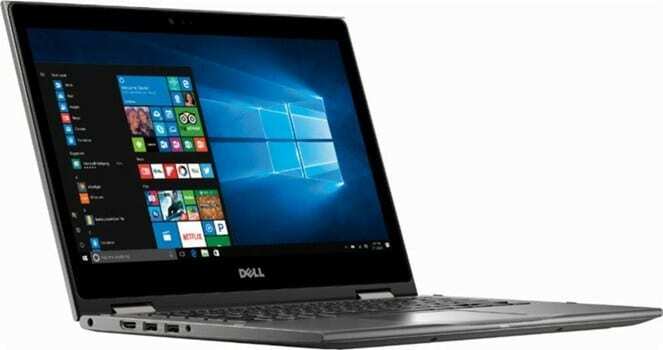 With a screen size of 13.3” the Dell Inspiron 7000 happens to be extremely lightweight at 3.68 pounds and offers 2-in-1 laptop accessibility. 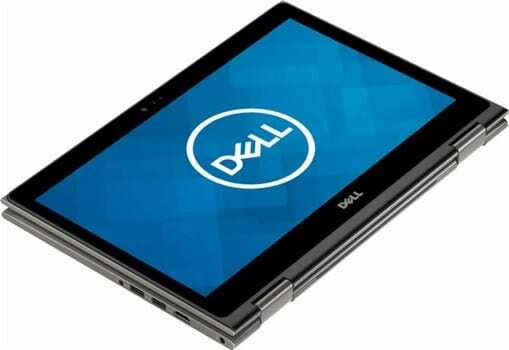 This means that you can use the Dell Inspiron 7000 as a traditional laptop, use it as a tablet and also keep the laptop in tent mode to watch movies or read documents. However, just like the previously mentioned Acer Swift 3, this laptop too comes with AMD Ryzen 7 2700U CPU and is coupled with 12GB of DDR4 RAM. It also includes a 256GB, which is adequate for storing documents and files, yet you feel the storage to be low; then you can anytime swap the 256GB SSD with a higher storage. Coupled with the CPU is AMDs integrated GPU called as the AMD Radeon RX Vega 10, which is almost 50% faster, compared to Intel UHD 620 and it can handle basic graphics stuff with ease. Being a 13” laptop; you do not get a numpad on the keyboard; however, what you do get is fairly large touchpad that is very easy to use. Even the 13.3” touch screen has resolution of 1920 x 1080 and happens to have an IPS panel as well. The only downside is that the screen is glossy and that can be irritating to some people and also happens to be fingerprint magnet too. If you’ve reached till here, then I hope you enjoyed reading the article and would have already made up your mind on which laptop to buy. If you did, Congratulations! If not, then do let me know in the comment section below, what are your specific requirements, and I will try my best to suggest you the best laptop that I can. Moreover, be rest assured that this list will be updated from time to time, hence if you have 6 months or 1 year to get started with medical school, you’ll only find the latest and best laptop every time. Such a great list of laptop, finally found what I was looking for laptop and thanks for all hard work you put on it.